TPMS should be a requirement not an option on any RV type. 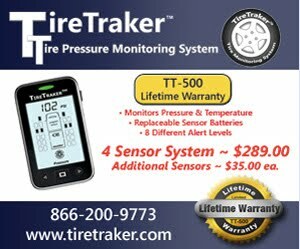 You invest 10's of thousands of dollars in your RV even more and can't afford $500.00 on a TPMS?? for shame. I would like to comment on a TPMS system that you refer to in the above article. I bought one a few years back. Every time I stopped for fuel, I had from 1-3 tire monitors go off for low pressure. This became very annoying. Once I had a blowout and the tire was completely destroyed. 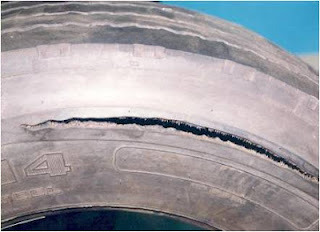 An hour later, the TPMS still showed full pressure in this tire. I called the manufacture of this TPMS and was sent a new receiver and 3 new tire pressure monitors, which did nothing to solve my problem. As this system was only a month old, I requested and received a return of my money. Happy watching my tires in the mirrors. Don't know what the problem was with your unit. If they were "going off" at fuel stop clearly something was obviously wrong and the problem should have been fixed. Ditto on valves. I will read all your posts on that as I have lost pressure after topping up an RV tire and probably had a grit issue as well. Lose air, not loose air. We have an Itaska Spirit 29B (Class C) that has started throwing wheel covers at 60 MPH late in the day of long drives. Is there anything you can think of we can do to better lock them to the wheel. Tires are nominally at 80lbs cold and the problem does not seem to be closely related to road condition. Sounds like an issue of proper fit of the covers to the wheels along with flexing of the wheels. Maybe a different wheel cover design or manufacturer would solve the problem.